Woke up to bright sun, but the wet season descended in bits and pieces throughout the day, bringing short showers. No worries. No rain under Ocelot! Today is the Thai Queen's birthday, or as they say, Mother's Birthday, so the guys all asked permission to leave at 3:30, making it a full pay day, but a short work day. Okay by us. We had secret plans for an end‑of‑the‑day celebration. He was getting about OK today, and he dove right back into the teak project. First job was to finish creating the teak frame that goes around the short, wide aft deck. 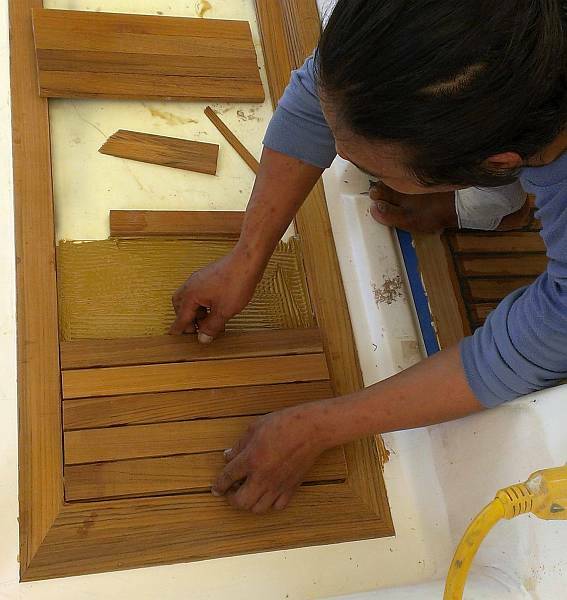 In order to make the planks line up from the aft deck (through the cockpit mini‑doors) to the main cockpit teak, he had to build special (not quite rectangular) end pieces for the frame, because the surrounding gelcoat isn't square. And it's true, the boat is not square, and after all the guys working on the fiberglass and filler rebuilding, we ended up even less square. But Houa can fix it, and we imagine that we'll not even notice it. At the end of the day he was epoxying the corners of the frame together. Houa also worked on the teak‑covered step that goes down into the companionway - Ocelot's last section of teak deck. This is also tricky, as the walls are not straight. He knows exactly which worker it was (and so do we) who didn't get the bulkhead straight. No, the guy no longer works for us, but Houa can fix the look of it with some clever teak work. Lek spent a couple hours masking off and doing a final cleaning inside the port aft cabin, ready for the varnish spray. But Baw decided to work on the separate doors and tables today instead of spraying. Not sure why. Maybe he just wanted to be sure to have a good start on the bigger project. To that end, the morning was spent moving tables and building platforms to hold all 28 doors from Ocelot's interior. The guys ended up with everything under Ocelot so that there will be no rain on the new varnish. Just before 2pm Baw and Lek began the slow, steady application of the 1st coat of Epifanes gloss varnish to the sanded and alcohol‑wiped doors. The plan is to put 2 new coats of gloss on the insides of the doors, and 3 new coats of gloss on the outsides. This will be followed by 2 satin. Heru and Yando and Chambron wet sanded the salon and cockpit tables in preparation for their 2nd coat of polyurethane on the flip side of what was done on Saturday. Just at 3pm Baw was able to do a last minute wipe‑off (there is so much dust in the yard!) and get that coat of polyurethane on the tables and the nav desk table top. Jon spent the day with his outdoor speakers for the stereo system. The speakers are several years old and have yellowed, but we'll replace them when we get to Langkawi, where it's cheaper and there's more selection. One speaker even needed its tweeter super‑glued back together. Since the connections all looked a bit skanky he decided to solder everything together, with screw‑in barrel connectors to the (new) leads coming from the stereo. With some luck we'll be able to play some of OUR music though our targa bar speakers soon. Thai music is interesting, but the current vogue is (apparently) to slide up to a note, sometimes never quite getting to the right pitch. We call that "music to curdle your lunch by." Ethnic, perhaps, but we'd rather work to some Boston, Chicago, Doobie Brothers, Billy Joel, Elton John, and Santana! It turns out that today is not only the Thai Queen's birthday, but also Houa's 34th birthday, and even our son Christopher's birthday back in the US (where it was still the 11th). So Sue scootered out in the afternoon to reserve an ice cream cake at Swensen's Ice Cream shop just down the road, and to get some computer work done at the apartment. By 3:30, all 9 of us at the yard were singing Happy Birthday! Sue, of course, figured she deserved the cake, as she had had the hardest job, that of birthing a baby for the first time 27 years ago! Happy Birthday All! Another one of those quietly productive days, with the temperature and humidity monitored now up on deck: 83‑103‑90°F (28‑39‑32°C, morning, noon, late afternoon) and the humidity dropping from 85% to 44% over the day and no rain until late late afternoon. In this SW monsoon, with our big awning on the south side of our tent, it's often cooler with more breeze down on the ground. Baw figured the weather was good enough for polyurethane, and he managed to get 2 more coats sprayed on the cockpit table, making it 4 coats now on one side. Tomorrow those pieces will be flipped, sanded and sprayed again. 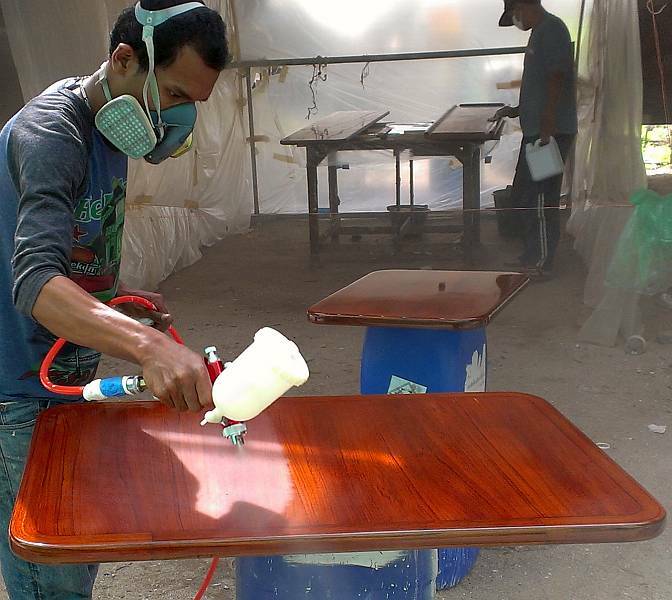 With Lek's assistance he also got another 2 coats sprayed on the salon table pieces, giving us 3 coats on one side. 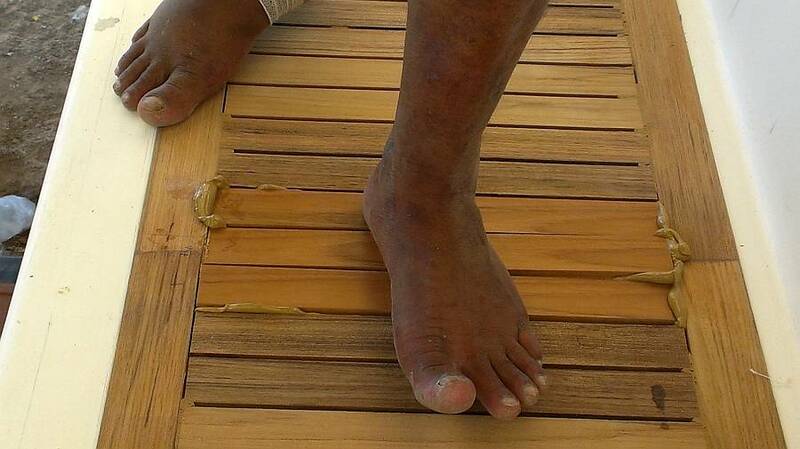 The sanding for these took place astern of Ocelot, with the Indonesians wet sanding all morning. 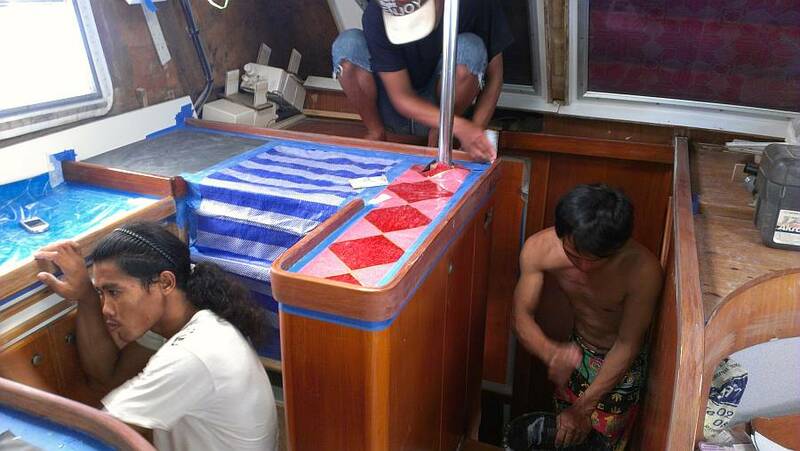 But the actual spraying Baw did under the neighboring boat where he hoped to be able to better contain the dust. Maybe it was better than under Ocelot, but it's still not perfect. This is just one dusty yard. The afternoon breeze didn't help, but watering down the sand underfoot did. Pla's 3 days inside port hull sanding and masking and cleaning finally paid off. Baw and the guys wheeled the heavy compressor over from the polyurethane spray back to Ocelot, rigged up the extractor fan, and Baw dove into the very contained port cabins. He got the first of 2 coats of satin varnish sprayed on the big bulkheads and door trims. It's getting close to finished. Tomorrow the guys will be lightly sanding that satin, preparing it for its second, and final, satin coat. 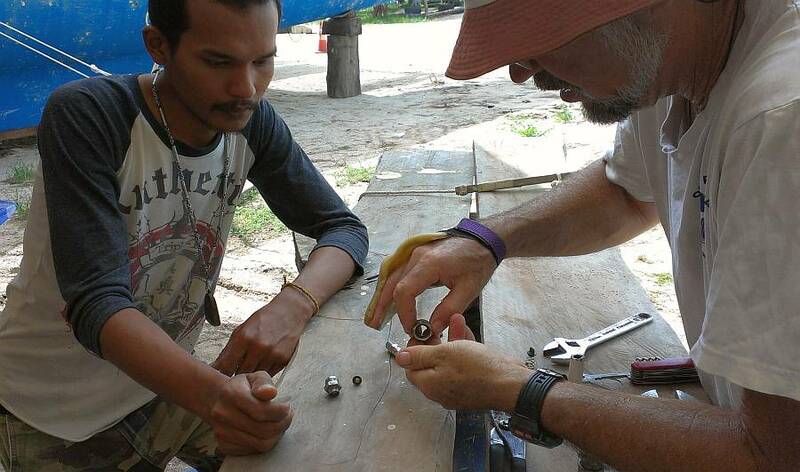 Yando, Chambron and Heru, our 3 Indonesians (with whom Sue has fun recalling some of her Bahasa Indonesia) were once again the sanding work‑horses. First thing in the morning they sanded the last locker doors ready for Baw to brush varnish them. Then they blue taped and sanded the cabin doors in anticipation of their first gloss varnish coat. The plan for the locker and cabin and head doors is the same as for the cabins themselves: 3 coats of gloss over the existing varnish (which is in pretty good shape, just thin), followed by 2 satin coats. Houa made some great progress on the teak. 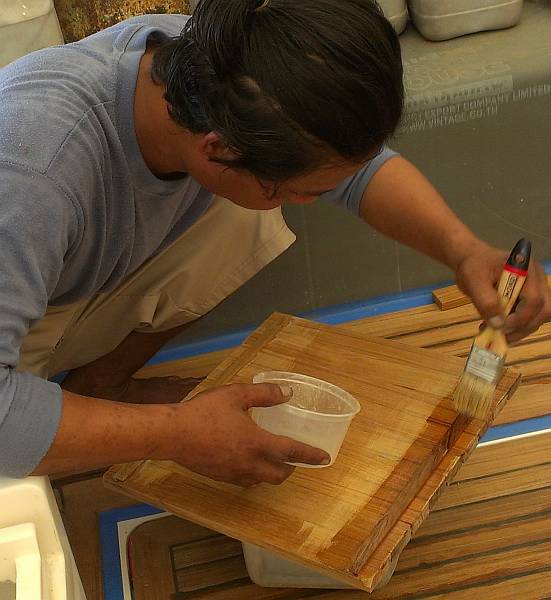 The frame for the aft‑deck is epoxied together so he sanded, cleaned and prepared the area where it will sit. 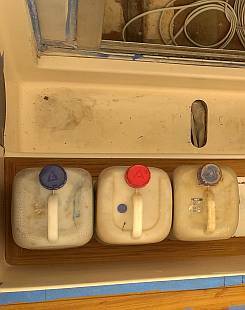 When all was right he applied Sika Primer to both the teak frame and the epoxy flooring, squirted out the Sika 298, paddled it into place and got the huge frame pressed into place, held down with the old epoxy jugs he'd filled with sand. He did an amazing job, considering he could really only put weight on one foot, and he still had to do the "teak dance" on the top of the frame to force it to lie flat and make sure the Sika skloobed out the edge, thereby sealing the wood to the floor. The whole thing will cure overnight. Next he worked on the frame for the step to the companionway, and got it fitted enough that he could epoxy the mitered corners together. Tomorrow he'll be able to Sika it into place! 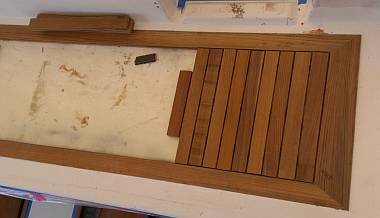 Then there's just the interior planks to add to those very last teak floor sections! Yay! Jon is still wearing his hand‑cast at the yard (well, most of the time) for protection but he's been doing exercises to try to pump some blood through his (broken) little finger. When he first tries to curl his right hand into a fist, his pinky only gets to about 30mm (just over an inch) of his palm. After opening and closing his fist about 50 times he can get it to within ¼" (6mm) of his palm, but when he tries it again 4 hours later, it's back out to 30mm. At this point he's not forcing it. It's only been 3 weeks and the x‑rays over the weekend showed that the bone is still very much broken. So right now he's just trying to loosen it up and get blood flowing through the area. We've got the mid‑week Blues -- Blue Skies, that is! All day! And relatively low humidity, like under 60%. A good day for varnish and polyurethane. And basically, varnishing is what happened at Ocelot today. Lek arrived early and sanded yesterday's gloss varnish on the laid out locker doors under Ocelot. By mid‑afternoon Lek had the handy bamboo and bristle brush in hand and we were all tiptoeing around to keep the dust down while he brushed on another layer of gloss. Pla and the Indonesians worked inside all day, first on the bulkheads in the port cabins and passageway, then all of them sanded the trim in the salon, ready for its next layer of polyurethane. Baw had intended to spray the final (satin) varnish on port side, but when he inspected it in the late afternoon, he said it really wasn't ready yet, and he wanted it right. You've got to love the guy, taking care of Ocelot like that for us. So tomorrow will see more sanding and cleaning, and then, with some luck, a morning varnish spray, marking the end of port side interior varnish work. Baw moved from job to job all day. He finalized the sanding on the cockpit and salon tables but couldn't spray right away because of a leaky pressure‑hose connector. So Baw and Jon pulled things apart at the hose connectors and the water trap. Lots of poking and pushing and fiddling. Then scavenging for spare parts, and Ta Da! An un‑leaky connector, and yet another layer of polyurethane got sprayed on the tables. Baw has also found several small gouges and nicks in some of our teak locker doors. He dabbed red polyester putty (often used on cars) to fill the damaged places. It hardens really fast, and then can be sanded back flush with the varnish. 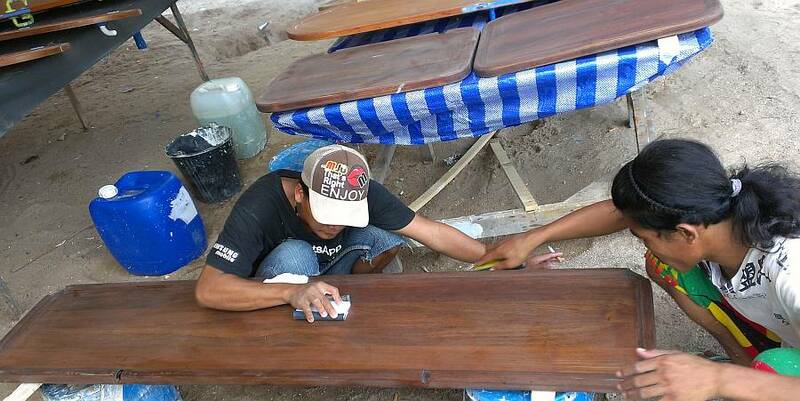 He will use his magic enamel paint and fine brushes to blend those repairs into the surrounding teak. Jon continued his electrician project of getting the stereo wired up to all the speakers. He had cut a CD of some of our favorite music from our own CD's, and brought it to the yard. The system worked so well, he blasted music across the yard for a few minutes as a test, then settled it down to good listening/working volume for the rest of the day. One of our favorite albums is Dez - the name Amanda uses on the album she made when she was cruising with us. Baw and Houa and Pla know Amanda, of course, and were impressed when we told them who was singing. Jon's after-lunch project was to create a fiberglass mounting for the new depth transducer that goes through the hull in the port fo'c's'le. The floor of the bilge (where the transducer hole is) is somewhat rounded, and of course the base of the transducer flange is flat, and never the twain would meet. So he used a scavenged bit of solid fiberglass and cut a round hole in it for the transducer. 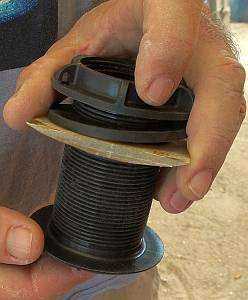 He rounded the bottom so it fits in the bottom of the bilge, but left the top flat for the transducer flange. Tomorrow, weather permitting, he'll epoxy it into place. Sue ran multiple scooter errands, including finding an immense second‑hand store very nearby that sells old bed sheets (from the hotel trade) by the kilo, so she re‑stocked the rag bag. Unbelievable how many rags we go through! Recycle‑conscious Sue sometimes brings them home to run through our home washing machine if they are not dirty with sticky things like Sika or oils. She put some of those rags to good use in the afternoon as she investigated just how dirty Ocelot's cabin top has gotten over the past 6 months. Answer: Very Dirty. 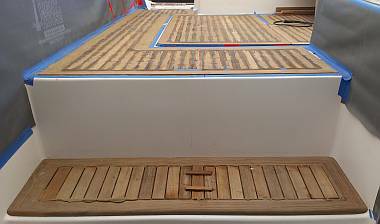 Next week we hope to begin the cleaning up and final preparation for the gelcoat spray on the deck, but all the spray areas must be cleaned first, so that we don't just grind the dirt into the sanding grooves. It will be quite a job. Houa's afternoon project was to start cutting and laying the fore/aft teak planks inside the aft‑deck frame. This is a big area (the full width of the cockpit), and it will be wonderful to see it filled with new teak! Unfortunately Houa ran out of Sika 298 (the brown underneath stuff) so we had to dish out another $100 for 4 more tubes. We hope this will get us to the end of the cockpit teak. But we don't want Houa skimping on 298, as we want the teak to stay put after it's laid down. Ocelot was a Five Ring Circus today, with star performers all over the place. And the weather was great: breezy, hot and clear. In one of the 2 Center Rings we had Houa, our intrepid carpenter, who came very close to finishing the cockpit teak today. And if the new batch of Sika 298 and Primer arrive tomorrow we will be a fully teaked Ocelot once again by end of the week! Houa cut, sanded, filed and fitted the short planks that go in the bottom step of the companionway, and then super‑glued each set of 10 planks together, then got them bonded to the epoxy substrate with the brown Sikaflex. He did this twice, leaving a spacer plank in the middle as a guide. Tomorrow he'll glue down the last piece of that puzzle. 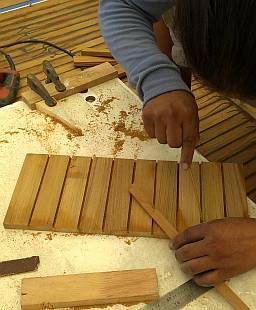 Houa's other performance of the day was was getting 9 fore/aft planks bonded down at each end of the aft deck. Late in the day he was able to measure, sand, cut and position most of the center planks, which will be bonded tomorrow, we hope. It's all looking fantastic! The other Center Ring attraction was Baw and his varnish spraying magic. First thing in the morning he had the extractor fan going, the compressor up to speed, and himself ensconced in head‑dress, breathing mask and long‑sleeve protection. 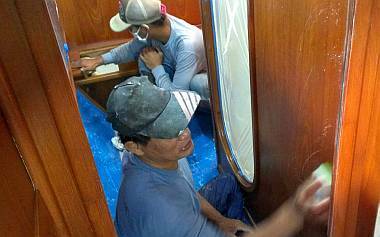 He wiggled down into the portside cabins and got a second coat of satin varnish on all the bulkheads and locker trim. This could have been the last of the port varnish, but visibility was so bad with the spray mist he wasn't sure he covered everything adequately. Upon checking it later, he said he has a "little bit repair." 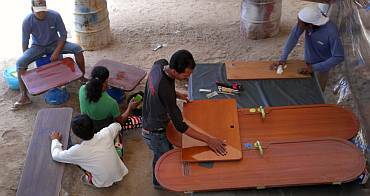 In a side ring, our Indonesians, Heru, Chambron and Yando, continued sanding just ahead of Baw and Lek. Lek got another coat of gloss varnish on the locker doors. Just how well they turned out will be seen tomorrow when they are dry. Side Circus attractions included Sue once again sanding away the damaged Nyalic off the mast. We are composing an email to the president of Nyalic, Skip Hawkins, to ask just what we are supposed to do about this darn filiform corrosion, and how to avoid its coming back. Nyalic touts itself as an anticorrosive, which is one of the reasons we chose it. We are ... well, disappointed would be an understatement, to have corrosion (of ANY sort) forming UNDER the Nyalic after only a few weeks. We're that close to stripping all the (expensive) Nyalic off and painting the spars, despite the additional work adding as much as a month to our splash date. Jon got to check off a good project today. Our depth transducer has always been in the starboard fo'c's'le, next to the knotlog (a little paddlewheel for telling our speed through the water). Now we've got a second depth transducer, and we want to mount it in the bilge of the port fo'c's'le, so we'll have one in each hull. The 2" (5cm) hole was drilled through the hull long ago, but the floor isn't flat - it curves up on the sides, so the transducer doesn't sit nicely. Yesterday Jon made a little fiberglass insert to put on the floor to give the transducer a good, flat mounting surface. 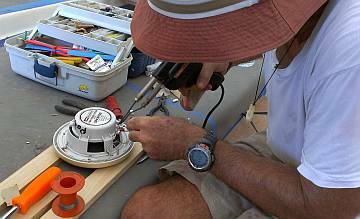 Today we epoxied that into place, and also made a flat for the outside (underwater part) of the transducer to sit on. We wrapped the transducer housing (a 2" diameter threaded tube with a flange on the underwater end and a big plastic nut on the inside end) in brown release tape and also made a pair of plastic sheets, about 6" (15cm) across with a 2" (5cm) hole in the middle for the body of the housing. 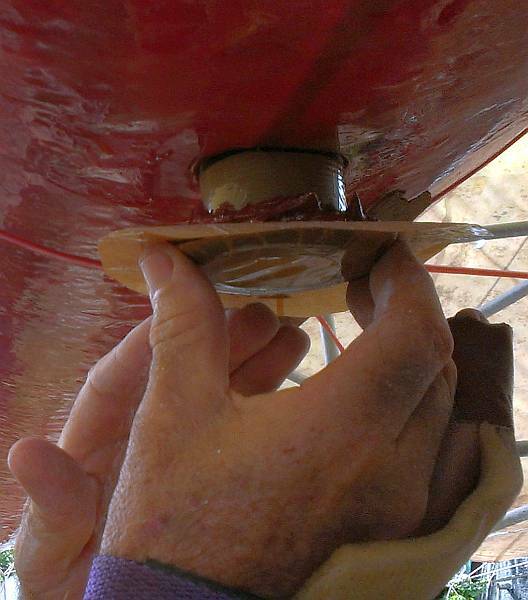 The phenolic epoxy mud went on, the transducer housing was pushed through the hull from the outside, phenolic epoxy and Jon's insert went on from inside, then the inside plastic sheet, and finally the big plastic nut. When the nut was tightened down, we could push the epoxy mud around through the plastic sheets to make nicely smooth shapes. We'll see how it looks when we take it apart in the morning. Hot, hot, hot. With requests for ice and water early in the day. A light breeze made things tolerable under Ocelot, but our drinks lady never appeared. It was a "more of the same" sort of day, as the guys moved towards completion of their varnishing and teak projects. 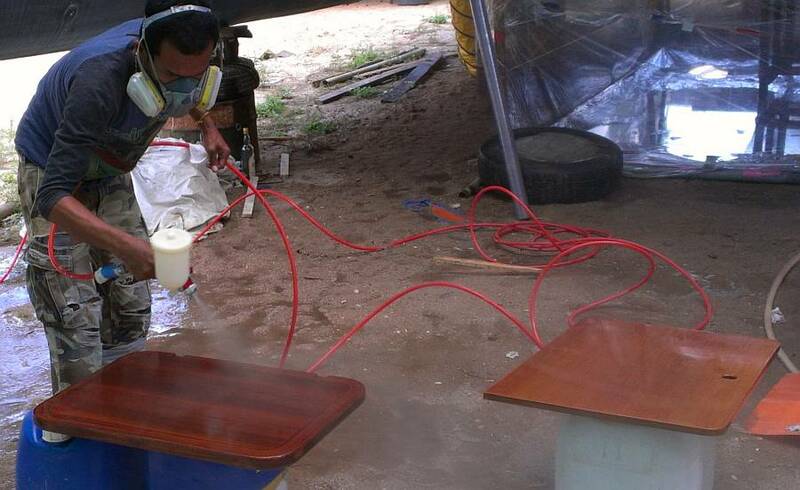 Heru and Chambron continued the (seemingly endless) sanding of the cabin doors and the cockpit and salon tables. They have not yet been put in charge of a varnish brush. 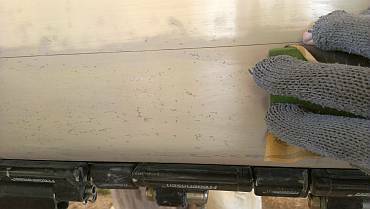 Pla made a point of telling us that he had varnished the latest coat on the salon trim, and that it would get another sanding. 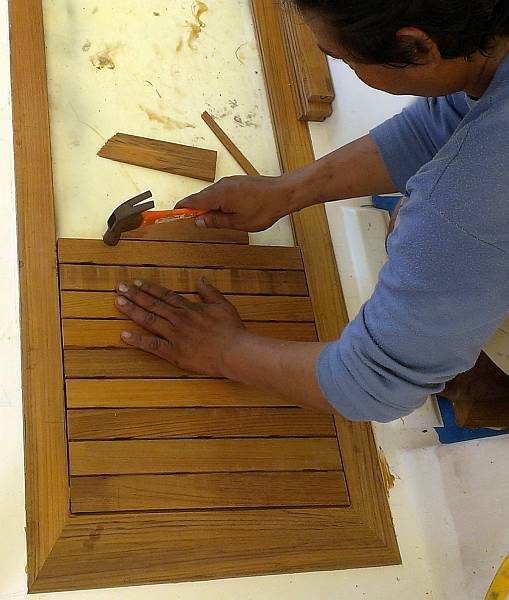 We saw Pla throughout the day helping Baw or Lek, and at day's end, back in the salon with Baw, sanding the trim. Maybe more polyurethane tomorrow? Or maybe one of the coasts of Awl Brite to top it off? Lek was in charge of the cabinet doors, all 20 or so of them. He spent the day fine sanding, cleaning and checking. Then he got the 4th gloss varnish coat on the outsides of all of them. 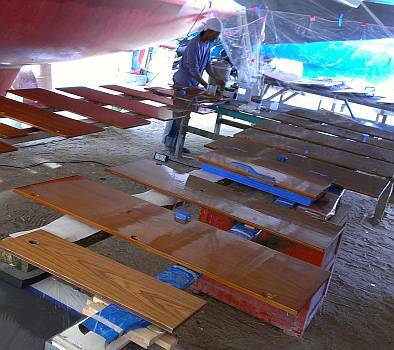 It's a challenge varnishing outside at the boatyard, due to the sand and breezes. It seems that the constant battle is how to keep the dust off. And the flies and other little insects bent on bug‑a‑cide. If this final coat looks good, then the cabinet doors will get 2 spray coats of satin varnish on each side, giving us a total of 5 layers of varnish on the inside of each door, and 6 outside. That should give us many trouble‑free years. Baw decided (and we agreed) to do the final satin touch‑up spray on port side once Houa has finalized the veneer repairs to a couple places down there. Then everything can be finalized together, with just one more spray set up. 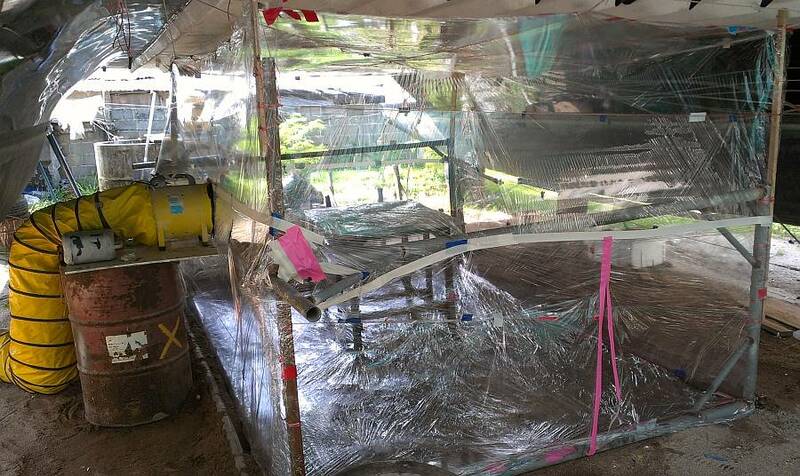 Baw realized yesterday that his spray tent under the neighboring boat was inadequate for keeping out the dust and bugs. So, armed with plastic filament string and new rolls of plastic, he and Pla spent the morning re‑building a very cool (well, probably airless and hot) spray tent for the final coats of Awl Brite that really want to be picture perfect. He was all ready to spray in the afternoon, but realized he was short of Activator (one of 3 components to Awl Brite). 'Twas a shame, but nothing to do about it. The stuff is only sold in chandleries up in Boat Lagoon. So Baw will scooter up there in the morning on his way to work to get what he needs. Speaking of Boat Lagoon, Mike dropped by just after lunch to deliver our latest order of Sikaflex 298 (the floor/teak bonding stuff) and more primer. 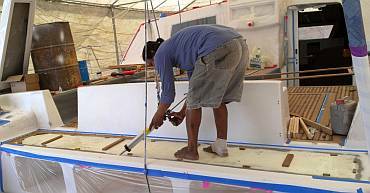 Houa was quite happy to have the new supplies, as he was all ready to lay the last 2 big sections of the aft‑deck and the last single plank on the companionway step. He's had to work very carefully and neatly up in the cockpit all week, to minimize the dust that travels down onto the sanding and varnishing team below. 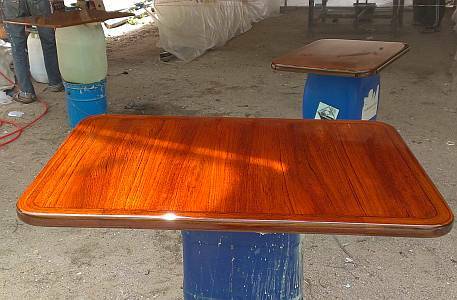 But he did get the long groups of teak planks for the aft‑deck super‑glued together, and with the new Sika available, bonded them to the (cleaned and sanded) aft‑deck. Wow! So near to completion! 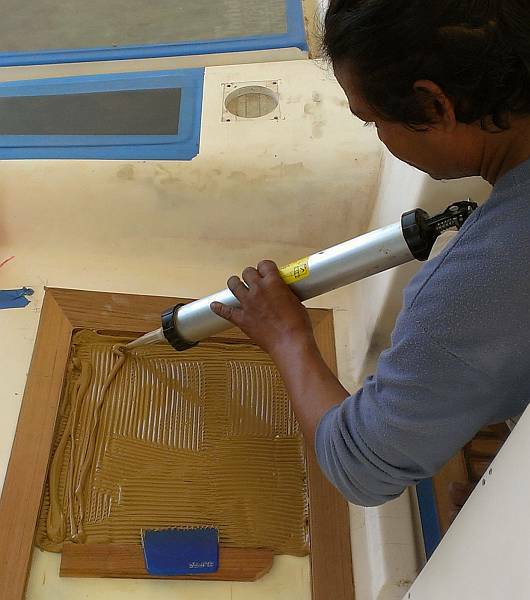 Tomorrow he plans to lay the black Sika caulking on both the companionway step and the aft deck! Jon was happy to see that his transducer embedding project worked well. 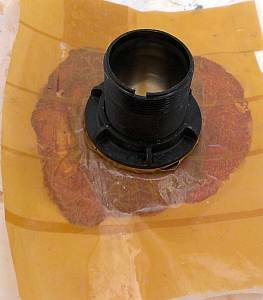 The transducer housing had to be unscrewed from its hole, as the epoxy had formed threads inside the hole, but those were soon sanded away. A bit of sanding on the inside and outside made both surfaces quite presentable. Check that one off! 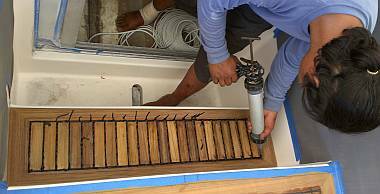 Next things to do with transducers involves wiring them in, but that's for another day when we have access to the interior of the boat once the varnishing is done. Jon and Sue spent a while planning out the steps to finish the new stainless steel rudders that were made for us by Luk Engineering last year. They're not as smooth as we want, not quite the right shape, and they need to be covered in fiberglass or they eat anodes. The first step to reshaping them is to coat them with epoxy. Getting epoxy to stick to stainless steel is a bit difficult, but we've had good results by roughing up and cleaning the stainless, painting on the epoxy resin, then sanding the stainless through the wet epoxy (this is detailed on our Epoxy page). The stainless actually forms an oxide layer that epoxy doesn't like much, but by sanding the stainless through the wet epoxy, there's no free oxygen so no oxide layer forms, and the epoxy can bond to the stainless itself, which it seems to do well. The rudders are quite heavy and will need to be rigidly supported in several different orientations while we work on them. Jon found an unused table that might serve, but its legs needed reinforcing. So he scrounged around until he came up with some appropriate wood and some long screws, flipped the table on its back, and cross‑braced all 4 legs. Now we'll have to drill some mounting holes in the table to hold the rudders securely while we work on them. Sue was the daily gopher, again. But she did spent some time cleaning the deck and cabin top in anticipation of the big gelcoat spray that we hope to begin next week. The memory of the original gelcoat chipping and peeling off is too distressingly vivid. 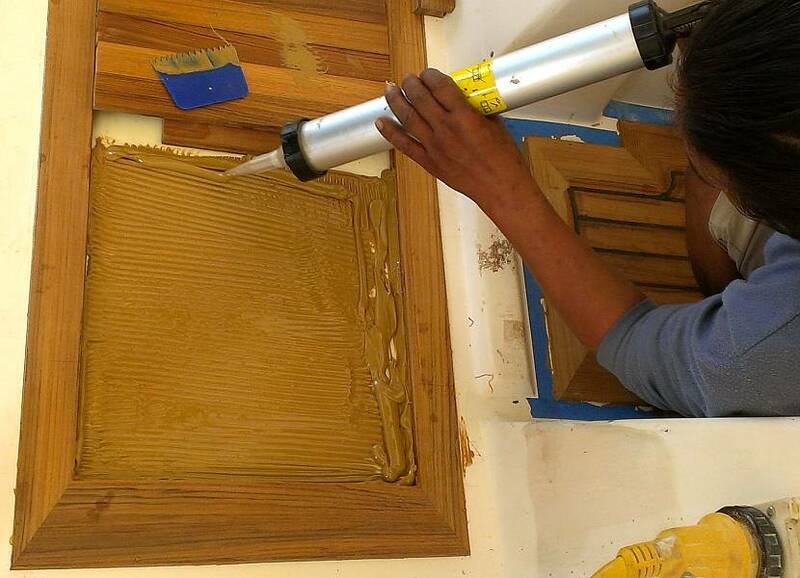 The best way to assure good adhesion is to be sure the substrate is sanded and clean, clean, clean. There are months of grunge to get off, so it's a satisfying job when done right. We have some concerns about the integrity of some of the filler (some doesn't come clean, probably because it's too porous) so we may be asking Baw to sand back and re‑fill some of the deck. Houa bedding down the last 3 pieces of the teak floor - WOOT! A busy, sunny end to the week, with more action on the varnishing and teak. Houa gets the Landmark Award of the Week. He spent the morning with his grinder, sanding the aft deck flat. This put a heck of a lot of sawdust in the air and down behind Ocelot, so everyone sort of had to hide. 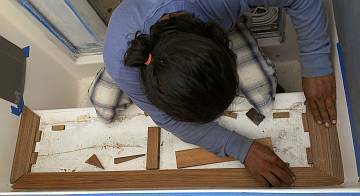 By mid‑afternoon he'd cleared away the excess brown Sika 298 used to stick the teak down, and cleaned and sanded the space. Then he cleaned, prepared, and stuck down the last 3 pieces of teak for the cockpit floor! A momentous occasion! There's still more work to do, of course, but all the teak is now stuck down. Further to completing the cockpit teak, Houa chiseled out the grooves in the teak on the companionway step, cleaned it up, and applied Primer. By late afternoon he'd shot black Sika calking into the grooves. He taped the step off and left it to cure over the weekend. This leaves only the aft‑deck still to be calked, which should happen on Monday. WOOT! Baw and Pla checked the final sanding of the cockpit and salon tables that are to get another layer of Awl Brite clear coating. By 10:30 they had the whole spray tent set up, with one of the 2 big cockpit table pieces inside the plastic tent on a table, and 3 of the 4 salon table pieces poised outside on water‑jugs, ready to be sprayed. Baw was very concerned about dust, so Jon had suggested putting 2 layers of plastic on the ground inside the tent. But Baw was still concerned that dust could still filter in, so he told Pla to spray water on the (plastic!) floor inside the tent! Of course, the water just puddled on the floor, raising the humidity in there. Fingers crossed that it didn't raise the humidity too much for the AwlBrite to cure! Sue volunteered to get on hands and knees and sponge up the water after the spray was done, and once the Awl Brite had time to kick. It was disturbing to find that the overspray from the AwlBrite had sort of melted the top layer of thin clear vinyl on the floor. Baw went home at lunch with stomach complaints, and we're hoping he feels better soon. Pla stepped in and took over the Awl Brite project, at least the interior part of it. In the afternoon Heru, Chambron, Yando and Pla were all in the hot salon sanding the galley and salon trim, then wiping it down. Pla mixed up 2 small batches (because we had asked him Please, to not mix too much!) and got another coat of glossy Awl Brite on the entire high‑wear trim. It is looking very spiffy indeed! And we hope it will be tough as nails for a long time! The jury is still out on whether to leave the trim glossy or cover it with one coat of Awl Brite satin. The rest of the boat will have a satin (not glossy) finish so leaving the trim glossy would accent it, while covering the gloss with satin will make it blend in more. Any thoughts? Heru, Chambron, Yando and Lek spent the morning re‑sanding the interior locker doors down under Ocelot. This was a good project to be doing while Houa was overhead sanding! 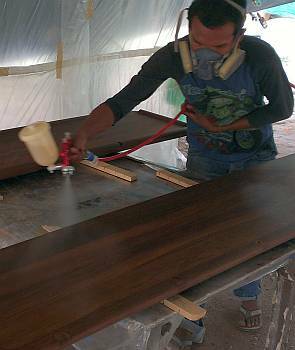 By mid-afternoon Lek had the Epifanes gloss varnish all ready, with the locker doors wiped and dry. 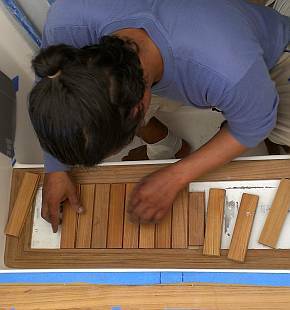 Using the multi‑bamboo brush he carefully applied another coat of gloss to all 20 doors. We think this makes 4 coats on the outside and 2 on the inside, but to be honest we've sort of lost track. We're pretty sure Lek knows, but we can't really talk to him. Next to come, satin top coats, just like inside Ocelot. We're getting there, coat by coat. Jon had to hold the fort in the morning while Sue scootered off to the Ear‑Nose‑Throat clinic near Phuket town to check out her sinus infection. Not fun but not dire. Anyway, Jon managed to get some pictures and move around from project to project to see what was happening. In between he worked on the set‑up for his rudder project, which is taking place next to Baw's spray tent, under the neighboring boat. The trick is to figure out how to hold the heavy rudders at just the right angle to let him do the various tasks that need doing to give them a fiberglass shape. More on that to come.